It's been a huge pleasure editing Discworld Monthly since 1996. My involvement with Discworld Fandom and writing the newsletter happened mostly by accident. I was late to the Discworld party as it were - the first newly released hardback I purchased was Men at Arms. Although I'd spent a few months before its release reading through the back catalogue. I got my first internet connection in 1995 and it came with a small amount of free web-space - so I decided to learn how to produce my own website - I didn't really know what to write about so I produced a few pages about my hobbies. Around this time I noticed that a student named Chris Ewan had just created a Discworld newsletter called Discworld Review. Chris didn't have any web-space so I offered to host a web version of his newsletter on my site. Discworld Review proved to be short lived, only lasting two issues (Issue 1 and Issue 2), before illness and other commitments meant Chris was no longer able to produce it. A while later I was contacted by Phil Penny, the then editor of Ramtop to Rimfall, asking if there were going to be any more issues of the newsletter. I explained that I didn't think there would be any more and Phil asked why didn't I take over. I immediately dismissed the idea as I had no experience of journalism and had only got a 'D' in GCSE English. A short period later I was talking with Bill and Richard and they asked about the newsletter and I explained that it had closed down and how I had been contacted by Phil. I then asked if they thought it would be something we could run with. They agreed to be deputy editor and letters editor and so we were off. Before we started work on it I wrote to Terry to ask permission to start writing Discworld Review: TNG (spot the Star Trek fan) and he kindly wrote back and said that it sounded like perfectly normal fan activity . Luckily before we got much further I decided to change the name and came up with Discworld Monthly. I posted on alt.fan.pratchett that I was planning to write a new newsletter to take over where Discworld Review left off. In the first month I got 250 subscribers and finally sent out Issue 1 at the end of April 1997. Less than a year later we had 10,000 subscribers and for the last few years we have floated around 19,000 subscribers from all round the world. It's been a huge pleasure editing Discworld Monthly since 1996. 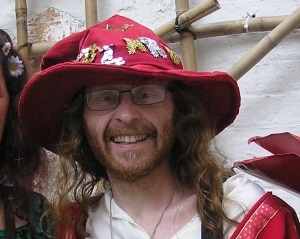 I've had many adventures such as being an extra in The Colour of Magic and visiting various parties and shows, and met many wonderful people over the years (including my wife Rachel) and plan to continue the newsletter for as long as people have interest in it. Thank you for sticking with us for all this time, it's been a blast! Copyright © 2012-2019 Discworld Monthly.